Moo Y. Lee is a technical staff member of the Geomechanics Dept., Sandia National Laboratories. He holds a Ph.D in mining engineering from the University of Wisconsin-Madison. He is a recipient of 1994 US National Committee for Rock Mechanics-Applied Research Award. Technical specialty includes in situ stress measurements for the design and stability investigations of underground space and laboratory simulation of underground conditions under true-triaxial state of stree.. Currently he is responsible for geotechnical monitoring (convergence, rock support system and blast vibration) and in situ stress measurements for the Yucca Mt. Project. Moo Lee also works for the laboratory investigation of slurry injection for oil-well restoration, laboratory characterization of frozen soil under dynamic loading condition, and constitutive laboratory testing of PZT. HF stress measuement in Yucca Mt. M.Y. Lee and Ehgartner B., Laboratory Evaluation of Damage Criteria and Creep Parameters of Tioga Dolomite and Rock Salt from Cavern Well No. 1, 92 p.,Sandia Report, SAND2001-0918, Sandia National Laboratories, Albuquerque, NM, 2001. M. Y. Lee, J.T. George, and Schelling F. J., Measurements of In Situ Stress and Deformability of the Rock in the Exploratory Studies Facility, Yucca Mountain, Nevada, in Workshop Proc. Rock Engineering for Underground Waste Isolation, p.25-40, Korean Society for Rock Engineering, Seoul, Korea, 2001. M.Y. Lee, B.K. Cook, A.A. DiGiovanni, E.D. Perkins, and Williams J.R, Simulation of Borehole Failure Phenomena using Discrete Element Modeling . Eos Trans. AGU, 82(47), Fall Meet. Suppl., Abstract T51A-0846, 2001. K. Sorenson, S. Howarth, M. Y. Lee, R. Finley, C. Kang, and Choi, J., A preliminary Concept of Geological Disposal System for High-Level Nuclear Waste in Korea, 12th Pacific Basin Nuclear Conference, Korea Atomic Industrial Forum Inc. and Korean Nuclear Society, Seoul, Korea, 2000. M. Y. Lee, D. Bronowski, and Grazier M., Development of Helium-Mass-Spectrometry-Permeameter (HMSP) for the Measurement of Hydraulic Permeability of Near-Impermeable Rocks and Geomaterials, Eos Trans. AGU, 81 (48), Fall Meet. Suppl., Abstract T11C-20, 2000. M.Y. Lee, D. Bronowski, M. Grazier, and Bauer S. J., Laboratory Evaluation of Hydrologic Properties of Columbus Limestone and Olentangy Shale for the Norton Compressed-Air Energy Storage Project, 53 p.,Sandia Report, SAND2000-2716, Sandia National Laboratories, Albuquerque, NM, 2000. M.Y. Lee, D. Bronowski, L. S. Costin, and Bauer S. J., Laboratory Evaluation of Mechanical Properties of Columbus Limestone and Olentangy Shale for the Norton Compressed-Air Energy Storage Project, 73 p.,Sandia Report, SAND2000-2717, Sandia National Laboratories, Albuquerque, NM, 2000. M.Y. Lee and Haimson, B.C., Additional Hydraulic Fracturing Stress Measurements in the Exploratory Studies Facility, Yucca Mountain, Nevada, Eos Trans. AGU, 79, Fall Meet. Suppl., Abstract T21B-04, 1998. M.Y. Lee and Haimson, B.C., The State of Stress in the Topopah Spring Welded Tuff,Yucca Mountain, Nevada, Eos Trans. AGU, 78, Fall Meet. Suppl., Abstract T42B-05, 1997. Lee, M. Y. and B. C. Haimson, Initial stress measurements in the Exploratory Studies Facility Yucca Mountain, Nevada, in Proc. 37th U.S Rock Mech. Symp., Rotterdam, Balkema, 1999. Lee, M. Y. and B. C. Haimson, Additional Hydraulic Fracturing Stress Measurements in the Exploratory Studies Facility, Yucca Mountain, Nevada, EOS Transactions, American Geophysical Union , 79, F841, 1998. Lee, M. Y. and B. C. Haimson, The State of Stress in the Topopah Spring Welded Tuff, Yucca Mountain, Nevada, EOS Transactions, American Geophysical Union , 78, F704, 1997. Haimson, B. C., M. Y. Lee, N. Feknous, and P. de Courval, Stress Measurements at the Site of the SM3 Hydroelectric Scheme, Near Sept-iles, Quebec, Intl. J. Rock Mech. And Mining Sci., vol. 33,487-497, 1996. Haimson, B. C., M. Y. Lee, and N. Chandler, Estimating the State of Stress at the Underground Research Laboratory from Hydraulic Fracturing Tests in Three Holes of Different Plunges, in Rock Mechanics Tools and Techniques, Eds. M. Aubertin, F. Hassani and H. Mitri, Balkema Pub., vol. I, 913-919, 1996. Haimson, B. C., M. Y. Lee, T. Doe, and N. Chandler (invited), Hydraulic Fracturing Stress Measurements for Site Characterization of the URL, Proc. Of the Intl. Conference on Deep Geological Disposal of Radioactive Waste, Publ. : Canadian Nuclear Society, p. 3.63 -3.72, 1996. 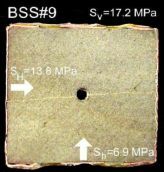 Haimson, B. C., M. Y. Lee, Estimating In Situ Stresses from Borehole Breakouts and Core Disking-Experimental Results in Granite, Proc. International Workshop on Rock Stress Measurement at Great Depth, The 8th International Congress on Rock Mechanics, Balkema Publ, Tokyo, 3, 1995. Talesnick, M.L., M.Y. Lee and B.C. Haimson, On the determination of elastic material parameters for transverse isotropic rocks from a single test specimen, Rock Mechanics and Rock Engineering, vol. 28, 17-36, no. 1, 1995. Haimson, B.C. and M.Y. Lee, Borehole Breakouts and Core Disking and Their Complementary roles as In Situ Stress Indicators; an Initial Laboratory Study, EOS Transactions, American Geophysical Union, 75, 677, 1994. Lee M. Y. and B. C. Haimson, Borehole Breakouts in Lac du Bonnet Granite: A Case of Extensile Failure Mechanism, Int. J. Rock Mech. Min. Sci. & Geomech. Abstr. 1539-1545, 1993. Wawersik, W. R., M. Y. Lee, B. C. Haimson, and J. R. Rundle, Hydraulic Fracturing Stress Measurements in Basement Rock, Long Valley Exploratory Well, Long Valley Caldera, California, EOS Transactions, American Geophysical Union, 74, 568, 1993. Haimson, B. C, M. Y. Lee, N. Chandler, and C.D. Martin, Estimating the State of Stress from Subhorizontal Hydraulic Fractures at URL, Manitoba, Int. J. Rock Mech. Min. Sci. & Geomech. Abstr. 959-964, 1993. Haimson, B. C. and M. Y. Lee, Stress Measurements in the Quimby Granite, and the State of Stress in the Western Midcontinent, in Proc. 26th Annual Meeting of the North Central Section of Geological Society of Americaa, 1992. Haimson, B. C., M. Y. Lee, and C. Herrick, Recent Advances in In-situ Stress Measurements by Hydraulic Fracturing and Borehole Breakouts, in 7th Intl. Congress on Rock Mechanics, Aachen, Deutschland, 3, 1737-1742, 1991. Lee, M. Y. and B. C. Haimson, PC-Based Data Acquisition and Analysis Software for Hydraulic Fracturing Stress Measurements, in 3rd Intl. Symp. on Field Measurements in Geomechanics, Oslo Norway , 455-464, 1991. Haimson, B. C., M. Y. Lee, J. Baumgartner, and F. Rummel, Structure and Plate Tectonics Inferences from In-situ Stress Measurements and Fracture Logging in Drillhole CY-4, Troodos Ophiolite, Cyprus, in Ophiolites and Oceanic Lithosphere, eds. E. Moores et. al., 1990. Lee, M. Y. and B. C. Haimson, In Situ Stress Measurements in an Inclined Hole Near Waterloo, Wisconsin, EOS Transactions, American Geophysical Union, 71, 1622, 1990. Lee M. Y. and B. C. Haimson, Statistical Evaluation of Hydraulic Fracturing Stress Measurement Parameters, Int. J. Rock Mech. Min. Sci. & Geomech. Abstr., 26, no.6, 447-456, 1989. Haimson, B. C., L. W. Tunbridge, M. Y. Lee and C. M. Cooling, Measurements of Rock Stress Using the Hydraulic Fracturing Method in Cornwall, UK. Part 2-Data Reduction and Stress Calculation, Int. J. Rock Mech. Min. Sci. & Geomech. Abstr., 26, no. 5, 361-372, 1989. Baumgartner, J., F. Rummel, B. C. Haimson and M. Y. Lee, In Situ Stress Measurements and Natural Fracture Logging in Drillhole CY-4, the Troodos Ophiolite, Cyprus, in Cyprus Crustal Study Project: Initial report , Hole CY-4, Geological Survey of Canada, 315-330,1989. Lee, M. Y. and B. C. Haimson, Applications of Statistical Techniques to Field Hydraulic Fracturing Data Interpretation, in Proc. 2nd international workshop on hydraulic fracturing stress measurements, 2, 502-541, University of Wisconsin - Madison, 1988. Haimson, B. C. and M. Y. Lee, The State of Stress in a Jointed Precambrian Rhyolite in South-central Wisconsin, in Proc. 28th U.S Rock Mech. Symp., Rotterdam, Balkema, 231-240, 1987. Lee, M. Y. and B. C. Haimson, Comparing Conventional Hydrofracturing with the New Fracture Pressurization Method (FPM) for the Determination of the State of Stress in a Wisconsin Rhyolite, EOS Transactions, American Geophysical Union , 68, 1460, 1987. Haimson, B. C. and M. Y. Lee, New Concepts in Hydrofracturing Stress Measurements, EOS Transactions, American Geophysical Union , 68, 428, 1987. Li, F., Q. Zhai, M. D. Zoback, B. C. Haimson and M. Y. Lee, Stress Measurements in the Red River Fault Region of Yunnan Province, China, EOS Transactions, American Geophysical Union , 66, 1060, 1985. Haimson, B. C. and M. Y. Lee, Development of a Wireline Hydrofracturing Technique and its Use at a Site of Induced Seismicity, in Proc. 25th U.S Rock Mech. Symp., Soc. Mining Engrs, New York, NY, 194-203, 1984. Haimson, B. C. and M. Y. Lee, Additional Stress Measurements Near the Monticello Reservoir, S. Carolina Using Wireline Hydrofracturing, EOS Transactions, American Geophysical Union , 64, 856, 1983.